Vermiwash is liquid plant growth regulator which contains high amount of enzymes, vitamins and harmones like auxins, gibberellins etc.. along with macro & micro nutrions. Spray it and watch your plants bloom like never before. Enriched Vermi Wash is a Liquid Plant Growth Regulator which contains high amount of Enzymes, Vitamins and hormones like Auxins, Gibberellins etc. along with Macro & Micro nutrients. Enriched Vermi Wash is a Liquid foliar spray recommended for all field crops, Fruits, Vegetables and Flowers. 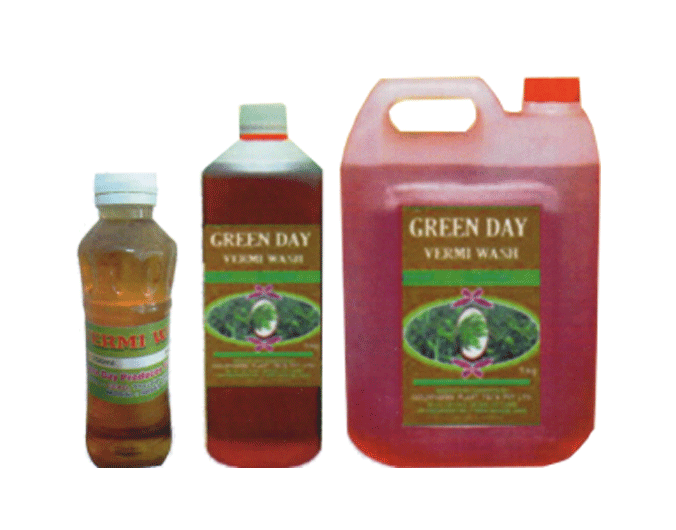 A mixture of Vermi Wash (1Ltr.) with cow urine (1Ltr.) in 10 Litres of Water acts as Bio-Pesticides and Liquid Manure.